Designed in Germany since 1861 and engineered to meet the most exacting industrial performance standards, Klassé needles have achieved the coveted ISO 9002 quality assurance certification. 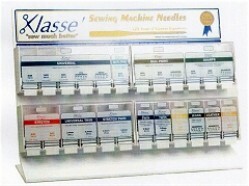 All Klassé needles go through 155 quality checks, earning the industry's highest quality rating for: stability at high speeds, seam appearance, clean stitch holes, and precise and uniform stitchability. Strength Where It Counts: A unique curved design at the critical clearance-above-the-eye (CAE) stress point distributes pressure equally and makes Klassé needles much stronger than conventional flat CAE needles. Each needle also has a unique number stamp on the machine insertion end, which allows you to identify its point style and size when separated from the original package.